You might find this snake in fields or even in your backyard or in a neighborhood park or if you are unlucky, hibernating in your foundation. Plains garter snakes tend to avoid water more than some other Minnesota snakes do. 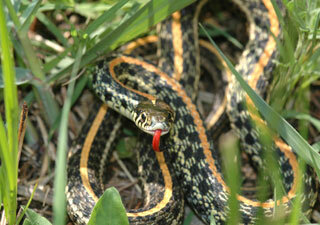 Typically 1 to 2 feet long, this garter snake is brown, greenish or black. Its three long, light-colored stripes are its most obvious marking. Plains garter snakes are generally 15 to 28 inches long. The background color varies from greenish to brown and black. The stripes are yellow, orange, or off-white. It also has black spots in rows. Plains garter snakes mate in springtime. They give birth to 10 to 70 or more young at a time. The babies are about 5 to 8 inches long. Plains garter snakes eat just about anything they can get their jaws around--frogs, insects, worms, fish, rodents, and eggs. They don't bother to kill their prey before they eat it. However, sometimes they will eat things that are already dead.